What’s the hottest state for solar power right now? Arizonans are well on their way to claiming that title. Following in the environmentally-conscience footsteps of California, Arizonans have proven their commitment to solar power and are hot on CA's heels. The solar industry has seen huge growth in Arizona over the past several years, and despite recent attempts to meddle with its attractive net metering policy, the market for solar panels and installation companies is continuing to grow. Combine that with the major drop in solar panel system prices and attractive tax incentives, and its no wonder Arizona has secured its ranking as second in the country for solar capacity. Just how much solar power is Arizona generating? 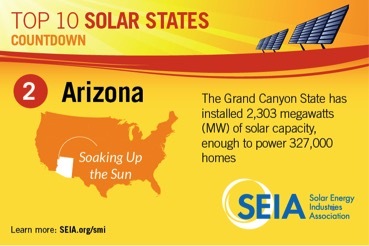 According to the Solar Energy Industries Association (SEIA), Arizona installed 258 MW of solar electric capacity in 2015 and installed solar capacity in Arizona has grown by 4 percent over the last year with over $582 million was invested on solar installations in Arizona. The utility company, Arizona Public Service (APS) has even reached a major solar milestone recently by surpassing 1 GW of solar energy capacity and becoming the only utility outside of California to achieve this milestone. “APS’s solar portfolio is almost an even split between rooftop systems and grid-scale projects, with 551 megawatts coming from rooftop systems and 499 megawatts coming from grid-scale projects,” according to a press release. Firstly, Arizona residents have Mother Nature on their side considering that its one of the sunniest states in the U.S., and therefore a great place to maximize the use of solar panels. There are a number of additional state-based solar energy credits available to homeowners who install solar panel systems. So pairing these local tax rebates along with the Federal Investment Tax Credit (ITC), which is currently a 30 percent credit, gives Arizona residents significant savings on a solar panel investment. Our solar savings calculator allows you to enter your zip code to learn what solar incentives will apply for your home, and the amount of savings you’ll receive if you go solar. There are many solar panel installation companies in Arizona, so its important to compare the prices and services from several companies before making your decision. By filling out the short form below, you will receive free quotes from qualified installers in your area.